Judith Reynolds drew this caricature in 2004 of Morley Ballantine, former chairman and editor of The Durango Herald. It was to celebrate Ballantine’s 80th birthday. She died Saturday at the age of 84. Reynolds and Ballantine had a friendship that lasted nearly 15 years, and started when Ballantine hired Reynolds to be the Herald’s first editorial cartoonist. 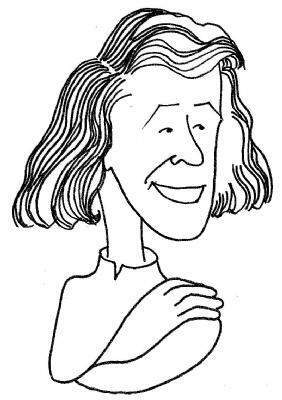 I drew a caricature of Morley Ballantine as a gift for her 80th birthday. When she opened the wrapping, she smiled, looked at me slyly, and said: "How come you used Al Hirschfeld’s style instead of your own?" Not only did Morley understand the humor in the exaggeration of her curly hair, the turn of her head, and the alert look she always seemed to have, she saw the Hirschfeld connection. She immediately recognized the style of America’s greatest caricaturist, the "Line King," as we in the trade refer to the late, great Al Hirschfeld. Since the news of her death Saturday, I’ve been fondly revisiting my years working for Morley and visiting her after she became too ill to go to her office at the Herald. What a fine mind. What a dry wit. What a lovely friend. In 1995, it was Morley who hired me as the Herald’s first political cartoonist. On a cold Friday one March, Morley and her son Richard Ballantine looked at my portfolio of writing and editorial illustrations and asked if I’d consider doing political cartoons. We agreed on an audition of sorts. They asked to see a few sketches based on local controversies the next Monday. Over the weekend, I cooked up eight possible cartoons about train smoke, traffic problems and overpriced real estate. I also satirized the then-new "Welcome to Durango" sign. When Monday came, I almost didn’t take in the darkest cartoon, a satire on the sign. My husband said: "Take it in. You’ll learn something about the Ballantines, what kind of newspaper people they are. You’ll learn if they’re really willing to satirize the powers that be." So I took in eight cartoons plus the "dark one." To my surprise and delight, Morley and Richard chose the sign cartoon to run the next Sunday. And so began an 11-year stint as the Herald’s first political cartoonist, and let it be known that I enjoyed complete editorial freedom. Morley eagerly awaited every cartoon and often commented about whether I skewered my target or not. She loved imaginative settings, e.g., two mosquitoes talking about environmental spraying, county commissioners at sea in a tiny boat and even harsh images about drunken driving. Oddly enough, they attracted more angry letters than any other topic. Morley particularly appreciated political caricature. She offered to buy the original drawing I did of John Kerry and G.W. Bush for an op-ed piece. The Herald paid me for first publication rights, but I own all my originals. For my most critical and most loyal fan, what else could I do but give it to her? She hung it in a place of honor and several copies of my cartoons in another place of honor – where every guest could see – the first-floor bathroom. Her all-time favorite, "The Evolution of Durango Man," which ran during a rash of snowboarding mishaps on the ski slopes the winter of 1996, held the place of honor – directly above the toilet. For a political cartoonist, that’s equivalent to hanging a painting on a high altar. And it clearly indicated Morley’s mischievousness. She always "got it." And so did I. My last visit took place a few months ago, just before I left for China. We didn’t say a lot. She asked a few questions, and I brought her up to date on my view of Durango’s cultural and political life – topics she always wanted to hear about. I noticed my Hirschfeld-style portrait of her still propped up on one of her many bookshelves. I’m so glad I drew it. And to this day, I appreciate the fact that she "got it."